BelarusDigest > All > Why Belarusians Prefer to Shop in Poland and Lithuania? In July the Ministry of Trade announced a plan to levy a tax on online purchases in foreign shops​. Since then the state agencies have been elaborating the methods that will be used for tax collection. It could become another tool to prevent Belarusian customers from buying abroad, both online and in the flesh. Earning almost three times less than Poles and Lithuanians, Belarusians often prefer to buy food, clothing, household appliances and many other goods in neighbouring EU countries rather than at home. The reason is simple: foreign shops have a wider variety of goods, which are on average cheaper and of better quality then in Belarus. Lukashenka stated in September 2013 that Belarusians spend approximately $3 billion annually on shopping in EU countries (over 4% of GDP). This is quite a significant number when compared with the fact that each year the authorities struggle to find the necessary resources for the paying back of between $3-4 billion of foreign public debt. Surprisingly, “richer” Poles are not interested in shopping in Belarus, while “poorer” Belarusians often buy in Poland. In the last five years spending of Belarusians in Poland has more than doubled, reaching just under $1 billion. At the same time, Poles spend around $25 million annually in Belarus. They mainly buy alcohol, cigarettes, and petrol. Although this number does not include the contraband that Belarusian smugglers take illegally to Poland. Various consumer goods in Poland and Lithuania cost less than in Belarus while their quality is better and the range is wider. This applies to wide variety of goods, for instance, cheese and meat, washing powder and shampoo, jeans and trainers, IKEA furniture and a new iPhone. In addition, in Poland and Lithuania, Belarusians can find the latest products and products with significant discounts. This is something rather rare in Belarus, especially in state-owned shops. Yet, 25 years ago there was hardly any difference between Poland and Belarus in living costs. Belarusians could go to Poland to buy or sell one type of groceries, e.g. eggs, while Poles could go to Belarus to buy or sell other types of groceries, such as meat. Today Belarus has hardly any good offers to tempt Polish customers. Even worse, it gets harder and harder to interest its own customers. Belarus occupies the first place in the world on the number of Schengen visas per capita. According to the European Commission, in 2014 Belarusians received 880,000 visas, which is 108 thousand more than a year before. These figures do not include holders of the Pole's Card which allows people who claim to have Polish roots the opportunity to visit Poland without a visa. Four out of five Belarusians declare shopping as the main purpose for visiting Poland, according to the Central Statistical Office of Poland. Moreover, each time Belarusians visit Poland or Lithuania as tourists, on business or to participate in various events, they always visit local shopping malls. Whether they go to Vilnius for a rock concert or to Warsaw airport, they will bring back goods bought in Poland or Lithuania. The Polish government established a special type of Schengen visa for Belarusians that provides “for shopping”. Malls close to the border can issue invitations for potential customers. The first invitation for a short term visa can be for free with the obligation to spend $70-100 on goods. The next time, VAT invoices which confirm the previous shopping escapade should be sufficient for receiving another visa, which is usually a long term multi-entry visa. Many Polish and Lithuanian shopping centres close to the Belarusian border organise special offers for Belarusians, like the annual Marathon of the Belarusian Week of Shopping and Recreation in Białystok, the capital of Podlaskie voivodship in Poland. During such weeks, shops and hotels grant Belarusians various special offers and discounts. VAT tax recovery on purchases on the border creates additional incentives for Belarusians to shop abroad. Białystok’s and Vilnius’ malls actively advertise also inside Belarus. Akropolis and Ozas in Vilnius, the mecca for Belarusian shoppers, hold major advertising campaigns in Belarusian cities. 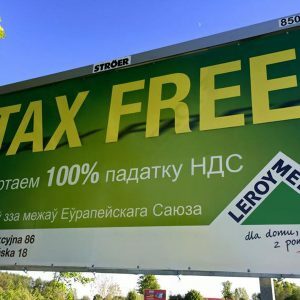 In Podlaskie voivodship of Poland shopping malls such as Auchan, Ikea, and Leroy Merlin install billboards written in Belarusian language. The shops try to market themselves among the increasing number of Belarusian customers. Belarusians became so active in shopping abroad that Lukashenka presented in 2013 the idea of introducing a $100 fee for Belarusians crossing the border with the EU. As a result of foreign shopping foreign currency leaves the economy putting pressure on the Belarusian rouble. The $100 fee was supposed to limit the negative impact of shopping abroad. However, following a wave of criticism Lukashenka retracted this proposal. To encourage Belarusians to shop in their own country on 10 March 2015 the government introduced new restrictions on the import of goods by individuals for private purposes. Now, the new policy allows Belarusians to import various duty-free items such as microwaves, refrigerators, washing machines and computers but they have to prove that they are bought for personal use. Furthermore, the authorities actively look for ways to tax purchases made online in foreign shops. In late June, the chairman of the upper chamber of Belarusian parliament, Michaił Miasnikovič, revealed a plan to introduce a tax on imported online purchases. The economic crises makes Belarusians count their money more carefully. Shopping abroad, particularly in big cities near the border with Belarus, has already become a way to save money and to buy better quality goods for many Belarusians. More and more frequently lucky owners of a Schengen visa travel for shopping in Vilnius, Bialystok and Warsaw. Belarusians will prefer to shop abroad as long as the Belarusian authorities sustain the old ineffective economic system which produces many uncompetitive and unwanted goods. The recent depreciation of the Belarusian rouble will temporarily make imported goods more expensive but the trend to shop abroad is irreversible. Official media has celebrated new contracts to buy Russian-made military equipment. Belarus plans to decommission another advanced military aircraft the Su-25, which the newly acquired Yak-130 aircraft with it's limited capacities will fail to replace. Minsk has succeeded in developing defence ties with Pakistan, while its arms designing projects with China may convince Moscow to offer Minsk better options to improve Belarusian defence. The government is also preparing for possible destabilisations linked to the October elections and the conflict in Ukraine. As Belarusian special forces participate in counterinsurgency exercises, the police train personnel in riot control and increase security measures around police stations in Minsk. On 25 August the Belarusian Defence Ministry signed a contract with Rosboronexport to buy five Tor-M2K short-range surface-to-air missile systems. This time, Minsk bought modified Tors which were installed on the wheeled chassis produced by the Minsk Wheel Tractor Plant (MZKT). Earlier in 2011-2013, Russia supplied Belarus with 12 Tor-M2E systems on caterpillar chassis. On 26 August, the Belarusian military signed with a contract with Russia's Irkut Corporation for four Yak-130 trainer aircraft. Apparently, the Belarusian Air Force will deploy more of these trainer and light attack aircrafts and loose further combat capacities. This results in further failures to the Belarusian and Russian Regional System. All this makes the establishment of a Russian airbase probable. ​The Belarusian armed forces decommissioned completely in the early 2010s two more advanced types of aircrafts: the Su-24 bomber and the Su-27 fighter, as well as many planes of other types. In the most recent development, on 29 August the Commander of the Belarus Air Force and Air Defence, Major General Aleh Dvihalyou said that the army “is currently considering the possibility” of replacing the Su-25 close air support aircraft with the Yak-130. On 15 August, however, the V​o Slavu Rodine, army official daily, reported that for the first time in the national army's history, it had used guided bombs deploying them from Yak-130. This raises serious doubts about the success in upgrading MiG-29s. Moreover, these doubts concern a major aspect of the upgrade, which is the ability to deploy modern ammunition. Deputy Defence Minister Major General Ihar Lotsenkau confirmed to the Russian RIA Novosti news agency that Belarusian and Russian specialists were designing a replacement for the Strela-10 short-range vehicle-mounted surface-to-air missile (SAM) system. The information about such a project first appeared in May. The timing reveals the background of this story. Moscow might have decided on this joint project responding to the conclusion of Minsk's agreement with China on the joint development of SAM systems. IHS Jane's 360 in June reported about such an agreement signed in 2012. Russia may have paid even more attention to Belarus-Chinese collaboration after the Belarusian Army presented in the military parade of 9 May 2015 a new multiple launch rocket (MLR) system called Palanez. It had been developed with Chinese involvement under another 2013 Belarus-Chinese agreement on MLR development. President Lukashenka himself has repeatedly linked the cooperation with China to Russia's refusals to help in defence field. On 15 August, Russian Defence Minister Sergei Shoigu announced that Russia, Serbia and Belarus would conduct joint military exercises this autumn on Russia's territory. It later became known that the exercises will take place near Novorossiysk in September. Given the urgent announcement, the exercises will likely serve Russia's internal political considerations, rather than any serious military aims. On 23-28 August, Belarusian special forces participated in the exercises Vzaimodeistvie-2015 near Pskov​. These were held to train the Collective Rapid Reaction Force of the Collective Security Treaty Organisation (CSTO). 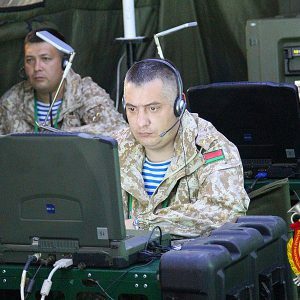 Belarus sent an operative group of the Defence Ministry and a company of Belarus' Special Operations Forces to the exercises. A counter-terrorism unit of the Belarusian State Security Committee (KGB) and the Emergency Response Ministry also participated in the exercises. They trained in counterinsurgency measures, guarding important facilities and emergency response. Although the new exercises represent Russia's new tendency to increase the number and scale of exercises to demonstrate its military capacities, the Belarusian government is genuinely interested in training its counterinsurgency units. Minsk fears possible destabilisation of the country's situation in relat​ion to elections and developments in Ukraine. So, the counterinsurgency exercises coincide with many additional Belarusian police personnel being trained for riot control, and increasing security measures around police stations in Minsk. Minsk Close to a Major Deal with Pakistan? During a recent visit by Pakistani Prime Minister Nawaz Sharif, President Lukashenka emphasised the importance of defence cooperation with Pakistan. On 5-12 August, the Pakistani delegation headed by the Federal Minister for Defense Production Rana Tanveer Hussain visited Belarus. They participated in the 1st Meeting of the Joint Belarus-Pakistani Commission on Military Technical Cooperation. Belarus-Pakistani defence cooperation has progressed for at least two years. The parties signed an intergovernmental agreement on military technical cooperation in Islamabad on 29 May 2015. Tanveer Hussain visited Belarus for the first time in July 2014, and after that contacts between Belarusian and Pakistani defence officials continued. The two countries undoubtedly are working on some major deal, which is very likely to involve Pakistan's ability to modernise mechanised armour. Pakistan bought a large quantity of Soviet tanks from Ukraine in the 1990s. Belarus provides sophisticated electronic and optic components for similar Russian tanks, so Pakistan may turn to Minsk for them. Another possibility is Minsk providing a comprehensive upgrade program for the Pakistani tanks now as their Ukrainian manufacturers have collapsed.